This holiday apartment in Plaza Catalunya is available for a short- or long-term stay in the Eixample district of Barcelona. The interior of this lovely residence features a creative and tasteful combination of styles, including typical elements of the classic Eixample home modern furniture and balcony. In the living room there is a cozy couch. The sofa also divides the living room into a lounge space with a gorgeous mirror and a dining area decorated with art made of natural leaves. A modern kitchen with brilliant stainless steel surfaces opens directly to the living room and comes equipped with everything you will need to prepare a meal to enjoy. The 2 bedrooms come decorated in two unique themes. One bedroom has 2 single beds and another a double bed. 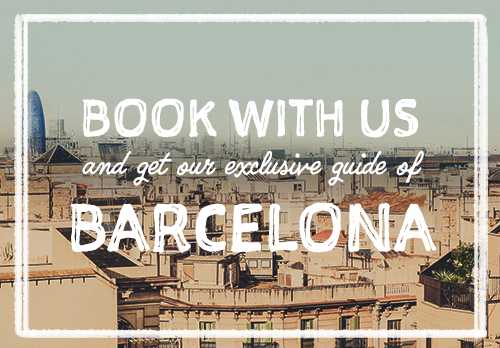 The apartment has a central location, two blocks from Plaza Catalunya and Las Ramblas. It is also very close to both Passeig de Gracia and Rambla de Catalunya, two of the most popular shopping avenues in Barcelona. Proximity to several metro stations and bus connections provides quick access to Barcelona´s long seafront and the Gothic quarter, known for its great nightlife. The neighborhood is characterized by a wide array of restaurants, bars and shops that will keep you entertained during your stay. 7 People are watching this accommodation.